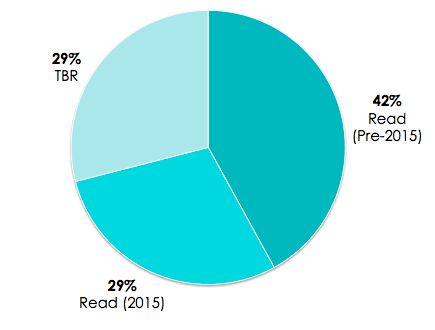 At the time I'm writing this post, I've read 32 books in 2015. I've been in a bit of a reading slump this year, and I just haven't felt the pull to pick up a book. I spent almost all of 2014 on a major reading binge, so I'm really not surprised that a slump finally hit. I have a feeling my pace will pick up as the seasons change, but we'll see! 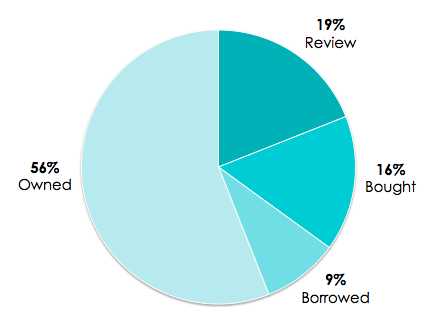 Either way, I'm quite pleased with this breakdown: 3 borrowed, 5 bought this year, 6 review and 18 owned (TBR and re-reads). 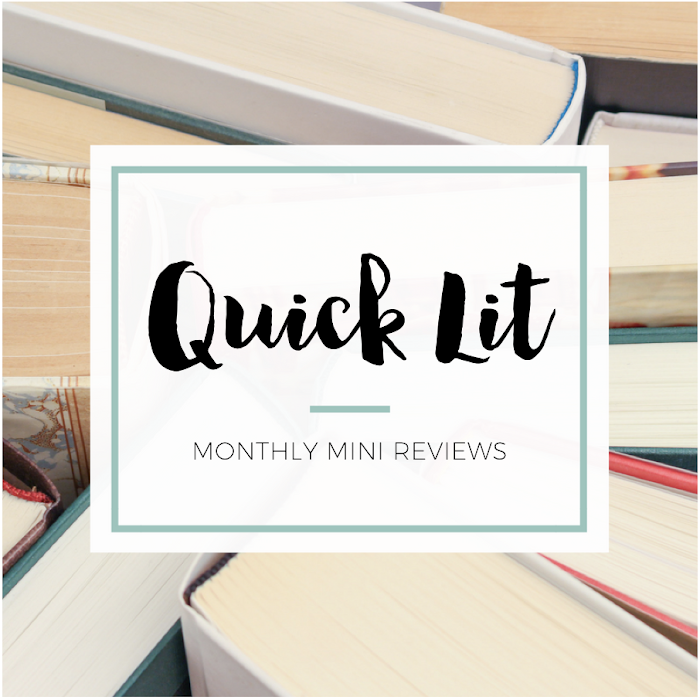 My goal is to read no more than 36 review books this year, and I'm definitely on track! I'm conflicted on my progress with this one! My birthday was in February, and I definitely received some books and gift cards. I didn't include the books that I was gifted, but I did count the ones I bought with gift cards. I've purchased 24 books: 7 with gift cards and 17 on my own. Of those 24, I've read 7 since I bought them, 7 are still on my TBR and 10 were books that I read prior to 2015 (either didn't own or owned a different edition). It's not awful, but I know I can do better. Either way, it's still an improvement over 2014 - and that's worth celebrating! 1. Having an accountability partner can make a huge difference. I knew teaming up with Alexa was a great idea, but I had no clue how much it was going to help! Whether it's offering my advice to her or seeking her input on a decision, it's so amazing to have a sounding board. 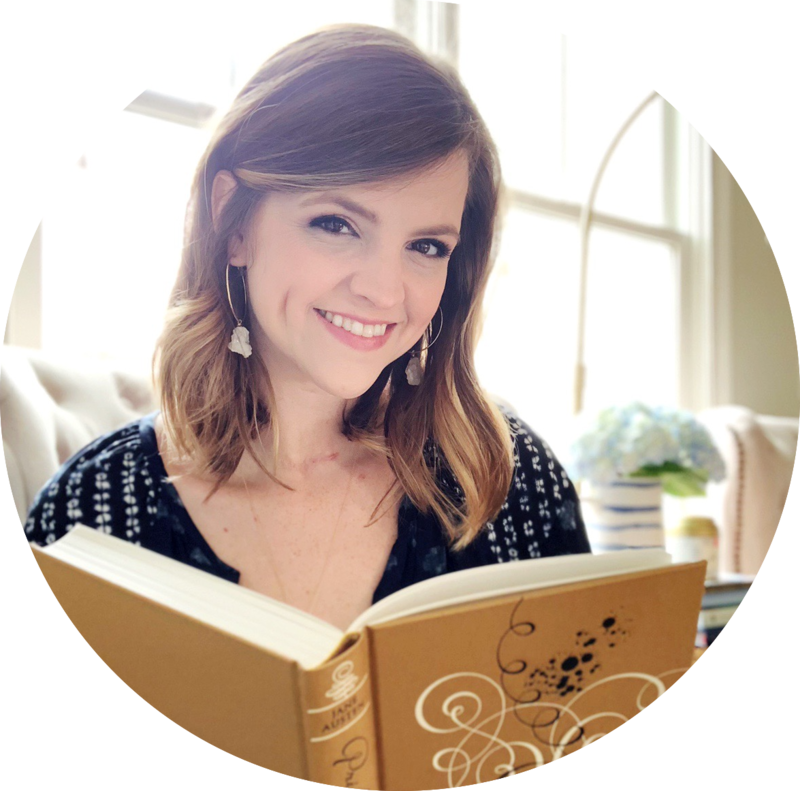 She's helped me decide if I really wanted to request a book... and whether or not a book was worth buying. And the best part? We both have realistic and reasonable goals that gives us some needed structure but still has some flexibility. 2. It's easier to evaluate review books if I ask myself, "Why?" Prior to this year, I didn't really think about why I wanted to read a book for review. Now, I'm forcing myself to ask that question with every book I request or accept. And it's totally changed my perspective! If my reason for requesting/accepting it is anything other than "I am dying to read this book!" then I don't let myself do it. Being intrigued by a book or wanting to build a relationship with a publisher/publicist aren't good enough reasons to add a book to my TBR! 3. Shopping my shelves can be so much fun! I think I'm most proud of the fact that I've gotten better about choosing books from my shelves. If I want to make a dent in my TBR, I have to focus on actually reading what I own. I've also been re-reading a lot this year, which has been so delightful. Even though my reading pace is a bit slower, I'm way happier with what I've been reading! The reading choices I've made so far (fewer review books, more re-reading, grabbing from the TBR) are all in line with my Picky Pledge goals. 1. Avoid boredom browsing on NetGalley and Edelweiss. I've only read six books for review in 2015 and currently only have nine on my TBR, which is a significant improvement from last year. However, I'm definitely still guilty of boredom browsing on NetGalley and Edelweiss! Whether or not I even request anything, it just puts more books on my radar - and that's the last thing I need right now. I need to be better about avoiding these two websites unless I'm specifically looking for something! 2. Online shopping (and free two-day shipping) is not my wallet's friend. I've discovered that I'm actually the opposite of Alexa in this area! It's way easier for my to walk away from a book in a store than it is for me to stop myself from online shopping. I don't know why, but I find it hard to resist buying something once I let myself explore a retailer's website. I think I might need to ban myself from even looking in the first place! Because putting stuff in my cart and noticing that I could have it all in just two days is really not working for my wallet. 3. Stop justifying acquiring more copies of books I've already read. I frequently buy copies of books that I've already read. It usually happens when I'm getting a finished copy of a book I read for review and absolutely must own... but I've noticed another trend lately. I'm basically collecting copies of books I've already read and already own. I'm most guilty of it with my favorite classics (there are way too many gorgeous editions out there), but I've been known to do it with multiple formats, too. It's time to crack down on this bad habit! I loved this idea when you first posted it and I still do! It may not be quite so official, but I'm also trying to be more picky this year about what I bring into my house. My "downfall" lately has been the library, but I don't feel TOO bad about that. I find it a lot easier to pass up on buying a book if I know I can borrow it from the library, but it doesn't exactly help me read more from my shelves -- always room for improvement right? I honestly think we're doing such a great job with our Picky Pledge, H! Sure, we've still been acquiring books from all sorts of sources. But based on our stats, we've slowly made a shift from reading more of the books we own or reading the books we buy right away. I love it, and I'm so grateful that we're doing this together! Oh boy, I always buy multiple copies of my favourite classics! Mostly Austen and Bronte - it's definitely a bad habit I need to curb.